How Doctors Think is a window into the mind of the physician and an insightful examination of the all-important relationship between doctors and their patients. In this myth-shattering work, Jerome Groopman explores the forces and thought processes behind the decisions doctors make. He pinpints why doctors succeed and why they err. Most important, Groopman shows when and how doctors can -- with our help -- avoid snap judgments, embrace uncertainty, communicate effectively, and deploy other skills that can profoundly impact our health. As a clinician in the aftermath of making a cognitive error, I found Dr. Groopman's book inspiring. It has opened my eyes to blind spots in thinking and how emotions play a bigger part than we want to admit. Reading this book has given me insight about how the very things that are strengths if taken to the enth degree can be a weakness. Groopman's book is inspiring and engaging, but most of it does not teach what the title says it will. Instead, most of the book tells how several physicians diagnosed or failed to diagnose correctly some difficult cases. Groopman's useful advice to the general public consists of this recipe: (a) try to tell a physician what the problem is, (b) if the physician does not seem to understand, object and try again, and (c) if that still doesn't work, find another physician. Groopman does not seem to understand that his advice fits, at best, those patients who have the time and the resources to spend, who have or strive to acquire significant medical knowledge, who are sufficiently assertive to carry out the recipe, and who somehow can access multiple physicians in a particular specialty. Coming from an elite background and living in an elite community, Groopman likely encounters many such people, but they are really a very small fraction of the general public. This is a useful guide for everyone and anyone who needs to see a doctor for whatever reason. It is also a practical guide filled with useful information on how doctors think. Not only does it focus on doctors, they focus on radiologists, internists and more. This book points out the differences that doctors face when they leave medical school and enter the working force. It is simply fascinating. It is also disturbing in a way especially if you already don't have faith in your doctors. Groopman shared his own experiences with doctors when he had to be treated for his wrist that has been bothering him. He had to see three different specialists with three different solutions and finally arrived at a conclusion that was successful for him. But it took over a period of time before he was satisfied. He provides examples of doctors who actually think outside the box as well as doctors who don't. He also provides examples after examples of patients who succeed in getting better or didn't succeed because they didn't listen to the right doctor or let fear get in the way or whatever. The point of this book is that doctors are just as human as the rest of the world, and that makes them fallible in a field where everyone wishes they were not fallible. It also serves as a reminder that medicine is not an exact science even though there have been progress made over the last 200 years, and in the last 2 decades alone. There is still much out there that are the unknown and doctors are navigating their way through it as well as the patients. Sometimes they succeed, and sometimes, they don't. This is a very thorough and insightful book and an useful one for all patients in perhaps in asking the right kinds of questions while searching for the answers. This is a keeper in my library. 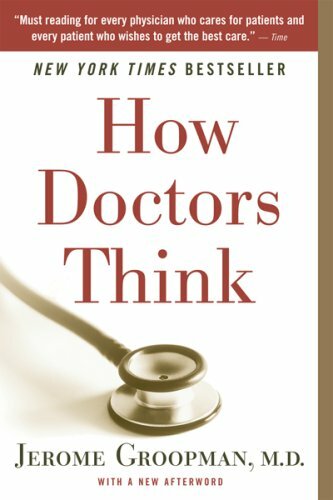 Dr. Groopman is an eminent and wise physician who has written this honest and incisive book on "how doctors think." The emphasis is on how they are subject to errors and omissions in perception, reasoning, decision making, communication, and action, but examples are also provided of excellent performance in which these sorts of errors and omissions are avoided. Dr. Groopman is an excellent writer, so the book is easy and enjoyable to read, and never gave me that feeling of "just wanting to get it over with." I think the book would have been better if some of the key non-medical terms (eg, "premature closure" and "framing effect") were italicized in the text and included in a glossary. I would also have liked to see a summary of key points, in bullet-point format, at the end of each chapter. However, even as is, the book still warrants a full 5 stars. There is actually an extensive literature addressing these issues in depth, in a general way which covers all fields of endeavor, but Dr. Groopman doesn't seem to be aware of this literature. See for example Human Error. Therefore, the particular contribution of this book is that it applies all of this in the setting of medical practice in an easily understood way. For that reason, this book is a must read for everyone: people need to have a realistic sense of the capabilities and limitations of their doctors, so that they can work with them effectively and improve outcomes. this book review is mostly about me and not about the book's contents, but it is about doctors. I have gotten some feedback recently, over the last year, implying that I have a tendency to blame doctors for my problems. and I thought about it and I have to admit that is true. I have various disabilities and etc. my issue in particular is that due to a cognitive impairment, I go through a process of mental churning when I think through things. it is a feeling of dizziness and pressure in my head. and in the past I have fought that in a way that has negatively impacted other people, in this case, doctors. I do feel bad about that and I understand that I will need to be extremely careful. my husband is the most fair judge of this and he said that I tend to assume I won't be listened to and then panic. and for example, when I was in the hospital, he said that I continued a conversation he and I were having instead of talking to the doctor. and I thought about it and I have to admit that is true. I do have a tendency to do that. to assume things will go badly and panic. my concern is that this book is written with the same negative type slant. after thinking about it for quite some time, I decided I needed to face my fears and so I am working on it. my fear is that doctors are uncaring and threatening. the problem is, in the many years I've had appointments, is that I have been living out that fear instead of facing it. I have to admit that I have tended to think quite a bit of other people's perspectives and that has sometimes led me to a tendency to blame them - it is not always instead of taking responsibility, but in addition to it. the problem is I had a brain injury which means my insight and memory are compromised. the difficulty is that I tend to blame doctors in particular, to fill in the gaps of what I do not understand. I did think about this feedback I received. sometimes I don't think in time to avoid saying stupid things. but I did think about it, b/c it let me know that something is wrong. I hope that this way, my fear and anxiety will be less. Dr. Groopman has written an important and relevant work on the mechanics of the doctor-patient relationship. A participate in a seminar I provide recommended this work in response to my observation during the seminar that people, by and large, analyze data more than they synthesize data. The gist of the idea is that we tend to deconstruct/deduce more than we construct/induce data. Dr. Groopman's work supports this hypothesis in the excellent examples and illustrations of actual doctors working with real patients. He discusses the intellectual/ethical/economic difficulties doctors face when they "think outside the box", and the real constraints of limiting their relationships/diagnosis to deductive reason exclusively. "How Doctors Think" is a series of anecdotes by various doctors, interviewed by the authour, with the underlying theme of when/why/how doctors can make mistakes. In the sense that it gave me insight into what really goes on behind the appearance of infallible expert, the book was fascinating. The authour talks about why doctors sometimes give you a multitude of answers, misdiagnose, rush, or don't seem to care, by giving you the doctors' perspective on the situation. There are two aspects I didn't care for, both closely related. Mind you, I got the book for insight into the doctor's life and nothing more. The first is the advice to the patients, where the authour tries to advise patients on what they can do to "help" the doctor avoid misdiagnosis. Encouraging patients to question the doctor or try to coach lateral thinking won't be effective for all doctor-patient relationships or situations. I happen to like asking doctors questions, for my own edification, but I don't know if that would work for everyone. The second is the apparent theme to doctors, to be aware of potential for cognitive errors, and examples of how other doctors handle themselves to reduce the chances of those cognitive errors. Mildly intersting, but too much time spent on it considering I'm not a doctor and I imagine most readers wouldn't be either? Groopman brings a refreshing account concerning the cognition abilities of physicians and its residual affects upon their patient interactions. He conveys that physicians inadvertently rely upon their initial professional socialization processes while in medical school by learning different matrices in determining diagnoses. That this mindset is ingrained with some physicians does reflect negatively on patients with deleterious effects. Especially, as these physicians becomes more entrenched in the course of their medical careers, in terms of his/her professional demeanor and acumen. That external forces also influence these purportly medically derived diagnoses: indifference, reimbursement, and conflict of interest. He infers that reluctancy exists among some physicians in delving into the diagnosis, treatment and prognosis for their patients. This grays the physician-patient relationship that the latter believes about the former. Chapter nine really illustrates the effect of the pharmaceutical industry upon physicians. Groopman states that there is a definite need for pharmaceutical research in exploring effective medications, but delineates that ethical standards are circumvented. He places the reader's perspective into the mindset of physicians by illustrating their practical terminology and analysis matrices. This is an excellent read for researchers, physicians, medical ethicists, social scientists and students to gain further insight into the cognitive reasoning by physicians as they conduct formulate and conclude medical diagnoses. Excellent book: Sharp, clear, and easy to read. One of these books that do not last on the shelf because there is always someone reading it in the family or among your friends. Groopman straddles the popular medicine, general statistics, and medical how-to genres in this book on how doctors approach diagnosis, prognosis, and treatment. As such, it does all three genres moderate service, and is written well-enough to be interesting, but it hardly strikes me as one of the best books of 2007, as many have rated it. There is a lot more to answering the question "What's wrong with me?" than meets the eye, and the book does a good job of showing a layman (like me) how difficult and risky doctoral decision-making really is. The doctor presents data that proves that doctors don't listen to you carefully enough. It is up to you to find a good one that does. It is your responsibility to watch their body language to make sure they are listening to you. This is a fantastic book offering insight into doctors' minds. As a clinician, it's helped me focus on avoiding common pitfalls in medical diagnosis and reasoning. Additionally, I feel that all people can benefit from the insight provided pertaining to the thought process involved in making medical diagnoses. Medicine is an art of balancing probabilities and of pattern recognition. The field of medical cognition (discussed in great detail in this book) analyzes physician thought processes and is teaching us much about the mechanisms of errors. Fascinating read and written in the same spirit as Malcolm Gladwell's Blink. Dr. Groopman investigates how doctors make misjudgments and misdiagnoses because of their failures to understand and acknowledge cognitive limitations and errors in thought that affect all of us and unbeknownst to us. He feels that if doctors take a step back, are introspective and insightful about these deficiencies and take appropriate steps to minimize these problems, we can be better clinicians. The doctors he profiles are truly inspirational, remarkable, and masters in their fields, not only because of their medical knowledge, but because of their recognition of what it takes to be superb people and clinicians. If there is an area of disagreement, then it is the fact that Dr. Groopman suggests that the pressures of managed care and inadequate time are the cause of many of these cognitive errors. Yet, he never actually proved this in the book. He never showed that doctors were more likely to make the correct diagnoses in an era with fewer time constraints. In fact, he laments that doctors in training, where he teaches at Harvard, don't know how to think and then realized that he hadn't be trained how to think either over thirty years earlier (and hence the reason for his investigation and this book). He claims that quality of medical care shouldn't be simply defined as whether or not a patient with diabetes has his blood sugar checked routinely, but Dr. Groopman also doesn't acknowledge that the major reason the United States ranks last in the world in keeping people healthy it is because the quality of care delivered never was measured as carefully as it is today. Research shows that 80,000 Americans die prematurely (twice the number of breast cancer deaths) simply because the right preventive care wasn't delivered. Had the nation adopted those health insurance plans, hospitals, and doctors, who performed at the top 10 percent of providing this care, these individuals would be alive today. How do they do so well? It is because of implementation of systems that promote excellence. As a practicing primary care doctor I understand the concerns of my colleagues of showing and proving that they are doing what they say. But we all know if you don't measure something and then re-evaluate it, how do you know if you are doing better? If anything, Dr. Groopman seems to suggest that medical care would be better if doctors didn't have to prove that they performed these metrics to the level of what the evidence shows to be effective even though other industries like financial services, manufacturing, and the airline industry do so rigorously to maintain their high levels of reliability, consistency, and safety. Although he encourages patients be advocates for themselves, to ask questions, and how to slow a doctor down and think more clearly with certain comments, from his own examples it is clear that it isn't easy to do and frankly somewhat intimidating. The book Stay Healthy, Live Longer, Spend Wisely: Making Intelligent Choices in America's Healthcare System has more practical tips and suggestions on how to get the right care. If there is a lesson to be learned, then it is that as doctors we need to understand that our thought processes can be clouded by emotions and can be limited simply because we too are human. To overcome this problem, which affects all of us, we need to be deliberately thoughtful and systematically introspective when caring for patients. As a practicing primary care doctor, I believe that we, not the patients, bear this responsibility and that I hope doctors in training are being taught this routinely in this country and that others welcome the opportunity to do better. While it should be a required reading assignment for medical students, interns, residents, and practicing physicians, better thinking doctors alone aren't going to improve healthcare quality in the United States. Dr. Groopman's subtle suggestions that they might are simply his error in thinking and his inability to remain open-minded and see that the world he trained in is far different than the world his trainees are about to enter. What this book does through the powerful tool of story-telling is both inform and empower us to become active participants in our own health care. I have a chronic illness that was repeatedly misdiagnosed (and thus inappropriated treated) for years. As I read this book, I began to understand how that process came about. I also began to see the individual physicians involved as more fully human, and to be able to forgive them for the errors they made, even those made out of arrogance. Frustrated, I was lucky (and stubborn) enough to keep questioning and searching until somebody could answer my questions, evaluate my condition with and open mind, and provide an accurate diagnosis. Since then, appropriate treatment has allowed me to "recover" my life from living as an invalid, and again become an active partipant in my own life. But my illness was not inevitably chronic: as a result of the delay in diagnosis, I will always live with its aftermath, and always be vulnerable to relapses. I wish I'd had a book like this to guide me through the process of questioning and discovery: it might have taken less than the 16 years it did. The mysterious reviewer who hides behind the name "The Doctor" (an arrogant stance in itself) takes exception to this book for the way it is written and for the fact that it uses anecdotes. This book is not a scientific treatise: it could not do its job if it were written as one. As a scientist myself, I know that while anecdote cannot stand as proof, it can stand in as illustration and example. Anecdote is one of the many ways humans transmit experience and wisdom, and make it meaningful at a personal level. It is entirely appropriate in Dr. Groopman's book. Simply stated, medical decision making is a complex endeavor where the "gestalt" diagnosis often leaves out the "what else". Having said that, I believe physicians are "privileged" human systems analysts working with heuristics of "open" (bodily) systems often similar to a Skinner Box. By that, I mean we often can not see or know the internal cascade of (subcellular systems) events of disease, but, only the phenomenological and often devastating results on our patients. Dr. Groopman writes an excellent, insightful and readable text on how we make and sometimes mistake clinical decisions. For instance given the difficulty of making diagnoses accurately in mammography, one might want to conjecture whether there is any gender specificity, to see if female radiologists readings are any more accurate than males. This can easily be studied. Then, if, say female radiologists have lower false positives and/or negatives we could query why. Our conclusions could be modeled for better readings going forward. Second, since cine mode for radiology studies of MRI are now the norm, one could perform a study to see if cine mode sample studies of normal, false positive and false negatives might be reviewed periodically in cine mode to freshen the minds eye. I believe malpractice cases could be reduced by simply telling the patient the choices behind our reasoning. With a possible false positive MRI, the patient should know there will be the anxiety of a needle biopsy procedure and the possibility of a cancer diagnosis. But, not performing the procedure to discover the presence of cellular pathology would be far more devastating to our patients and to the persona of any caring physician. Getting it right and doing better is who we are. These are the kinds of mental amalgams one gets from Dr. Groopman. I am a solo practitioner but after reading this book, I'm now a Groopman! Four years ago I went to my doctor in Massachusetts with a high fever and an earache. She diagnosed an ear infection and gave me antibiotics. Ten days later, I was in the hospital - in a room where they could turn on the negative air pressure at a moment's notice - with malaria. If I read Groopman's book before having that experience, I might have gotten the treatment I needed at a much earlier, safer stage. *	What is the worst diagnosis that could explain these symptoms? *	What organs are near where I'm feeling discomfort? *	Is it possible that I have more than one problem? *	What else could it be? *	Is there anything that doesn't fit? *	Is this treatment standard or do different specialists recommend different approaches? Why? *	How time tested is this treatment? The book describes a litany of medical cases, each interestingly (like a good tv show - see below). Groopman also describes lots of research on medical decision making. I found it 96% interesting. But if you don't find those elements interesting, the book may feel a little bit long. ** In that case, I highly recommend reading at least the epilogue, which concentrates some - but not all - of what patients and families can ask to help doctors do a good job. I don't agree with Groopman on everything; I have a little less faith than he does in doctors' judgment and a little more in evidence-based medicine,*** where it can be appropriately applied. But those aren't the things that matter in this book. Take-away: Give the book a try; if it starts feeling long to you, at least carefully read the epilogue. * The first third of the book basically felt like watching a season of House M.D., a show in which a brilliant doctor is surrounded by a smart team, each member of which brings her or his biases to the case of the episode, leading to incorrect diagnoses, until the brilliant Dr House saves the day. Each of the biases and many of the diseases have come up on the show. ** If you do find reading this stuff interesting, one of my favorite books by a doctor is Arun Gawande's recent Better: A Surgeon's Notes on Performance. The experience is common and can be more than frustrating. Something is wrong, the doctors don't listen (you are in and you are out and there was no time to ask questions) and they don't know what's wrong so say there is nothing wrong. This is the pathway to suicide. Groopman does not give you the solutions but helps you find some. If this is not always a page turner, it is none-the-less easy reading that takes the layman into the doctors mind and shows how the doctor works. Current research is used, with a set of readable notes replacing the usual bibliography. The layman and the doctor will both find the book full of really helpful hints. The seed for the idea of this book was planted several years ago while Dr. Groopman was in the course of supervising interns, residents, and medical students on rounds in a teaching hospital. While conducting the rounds in a customary manner, Dr Groopman became disillusioned by the responses of his charges. While these were unquestionably intelligent and educated students of medicine, he observed a failure in their ability to question, listen, and observe. At that point, as their instructor, he began to question how doctors are trained to think about their patients and the patients' problems. This book delves into the traditional methods that doctors have used to make decisions, as well as many of the problems that currently face the health care industry and the ways in which they interfere with the doctor and patient relationship. In today's world, the doctor must not only do the best possible job for his patient , but also comply with insurance companies, lawyers, algorithms, and flowcharts. Historically, doctors have learned as "apprentices" to other doctors by observing, doing, and teaching. But, even with the advances of modern medicine, doctors are still required to make many judgment calls. Medicine is never an exact science. Another area that is explored is Doctor/patient communication. Inability to engage the patient in meaningful dialogue is one of the problems encountered. Another problem in "doctor thinking" is falling back on stereotypical thinking and not approaching the patient's problems as a unique circumstance. The book also details the pitfalls that doctors can enter into by not evaluating their diagnostic processes. Fatigue, fear of failure, and interpreting data inappropriately are but a few. A physician by nature refers to his own area of expertise when evaluating a problem. For instance, if a patient visit's a surgeon, the surgeon looks at the patient as a surgical candidate. This is a generalization, but in a nutshell, a doctor wants to use skills with which he is most familiar. Dr. Groopman also calls attention to the influence of the doctor's decision on the "last bad experience". A fear of repeating an error sometimes clouds the judgment of the practitioner. While How Doctors Think is a worthwhile read that provides great insight to how doctors are trained and the many challenges they face, I am skeptical that this book will improve communication and outcomes for the average patient. I had checked out a copy from the library. A friend who had recently had to deal with her parent's illnesses started reading it and couldn't stop. So I bought a copy for her. It is worth having on hand as it has many ideas about dealing with doctors and knowing when to support, question, review or seek other ideas. Some of their thinking reflects the training of medical school and it is helpful to know why certain patterns of thinking are so prevalent. If you are a Doctor this is a must read ! !